12/2016 – The Glasshouse Community Carols were FANTASTIC! The biggest and best Carols we’ve ever had. So many of our young people helped with the set up and running of the night. Praise God. 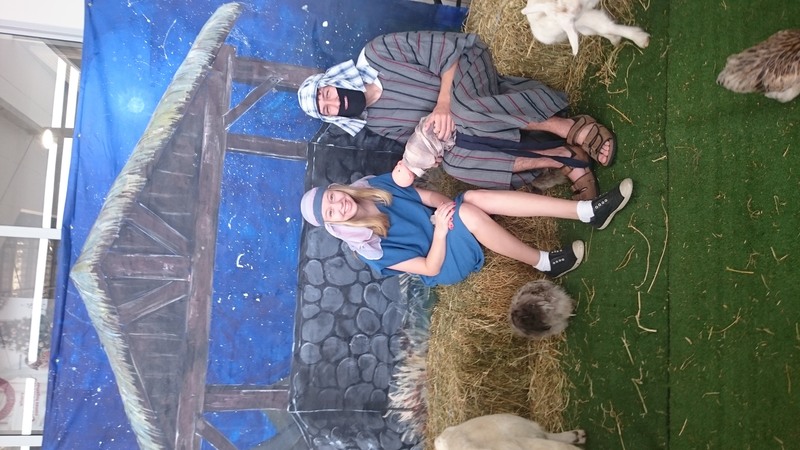 12/16 – Some of our young people also helped out at our Annual “Beerwah Nativity Scene” at the Shopping Village. Was a huge success! Thanks everyone!!! 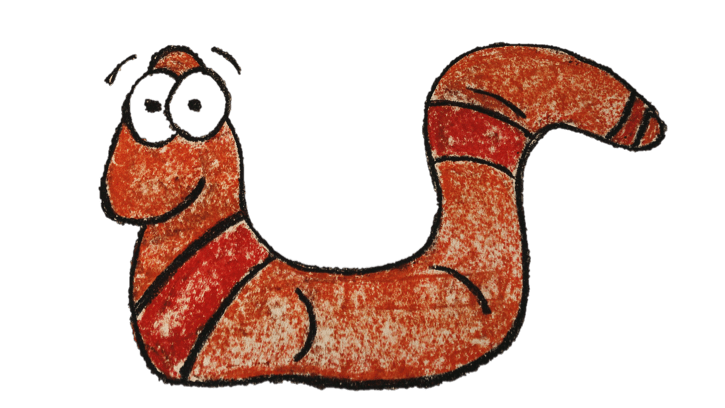 12/2016 – This Christmas holidays we’ve had a couple of events to keep the momentum up. Beach Day was awesome fun! 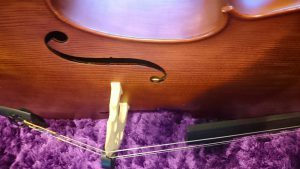 10/2016 – The Youth Service Team have begun running JAM Sessions most Sunday afternoons. 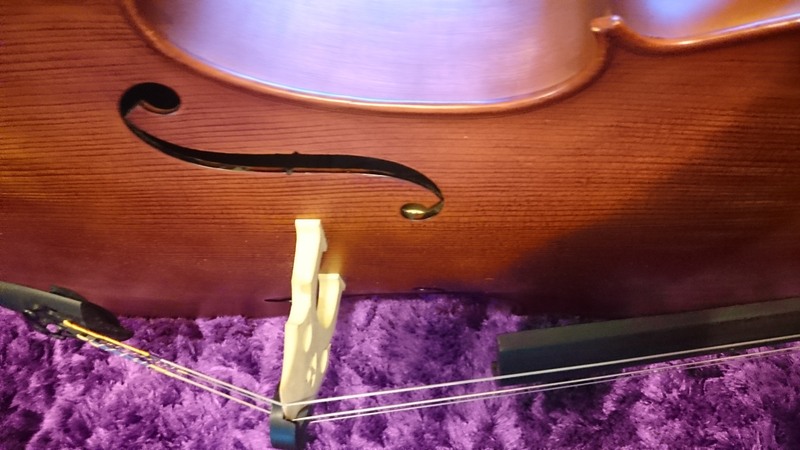 This is a great chance for our musicians can enjoy their love of music, learn some new songs and even have a crack at instruments they’ve never tried before! 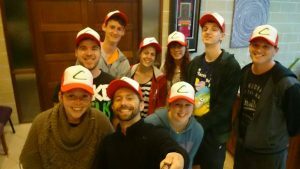 09/2016 – Our Pokéball Evangelism program has been going great guns! We have handed out around 70 pokeballs over the past month and are getting prepared for our 3rd and final Pokéwalk set for the new Pokemon Game release (Nintendo DS) on November 18th. 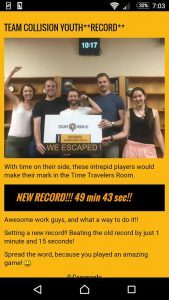 09/2016 – The Collision Youth Leadership team just went to try our hand at Escape Room Caloundra! 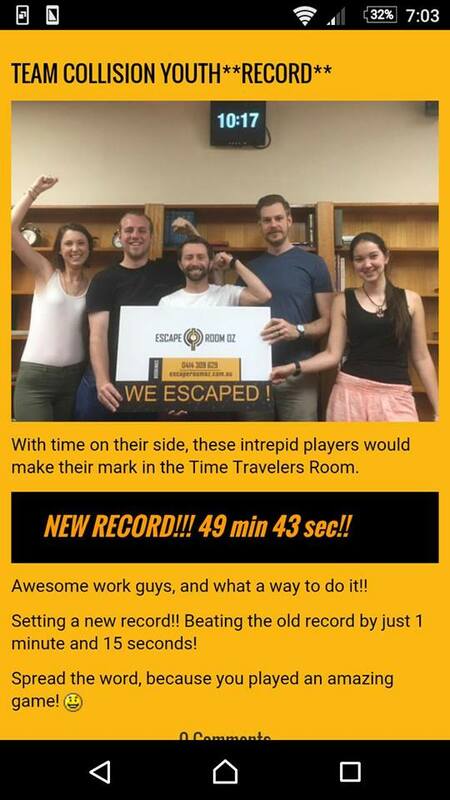 Turns out we are quite the team – Taking on the hardest rated room and escaping in just over 49 minutes (Setting a new RECORD!) GO TEAM! 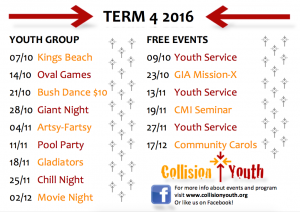 09/2016 – Introducing our new look Youth Program for Term 4! 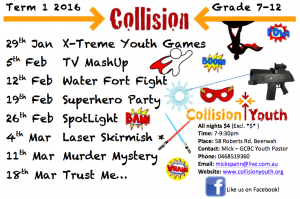 07/2016 – Collision Youth will be at this years Glasshouse Christian College FunFest!!! Come and find our Pokéstop pavilion on Saturday 30th July from 11am-4pm! 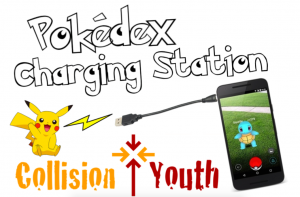 We’ll be set up alongside the church with couches, music and charging ports for your phones! 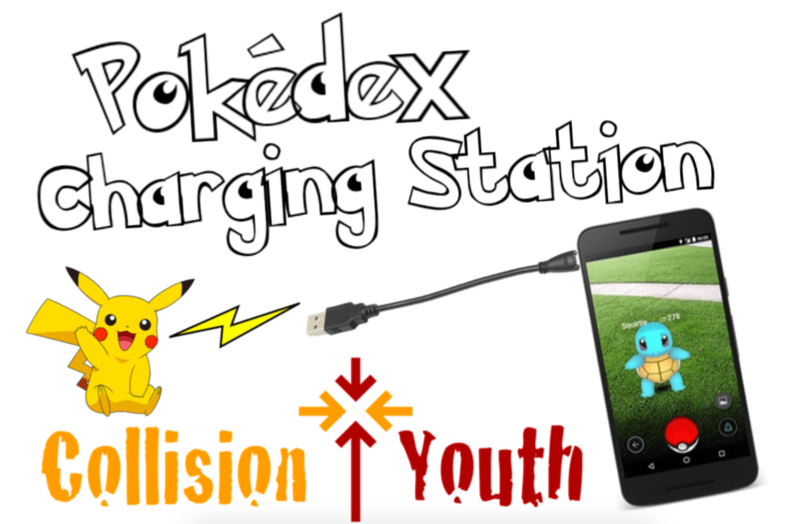 Every half hour we’ll place a Pokélure to make sure plenty of Pokémon come to join the party! 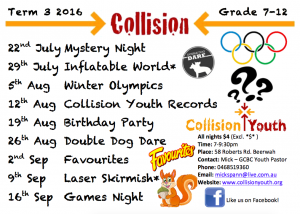 07/2016 – Here is our new Term 3 Program! 07/2016 -Deeper 2016 was a huge success! Thank You Lord Jesus for a fantastic time at the Discipleship Camp. We all got to know our bibles more and grow closer in our relationship with You. 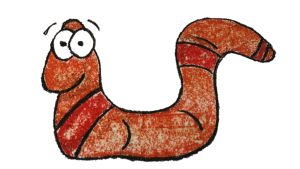 03/2016 – Introducing our Term 2 Program! 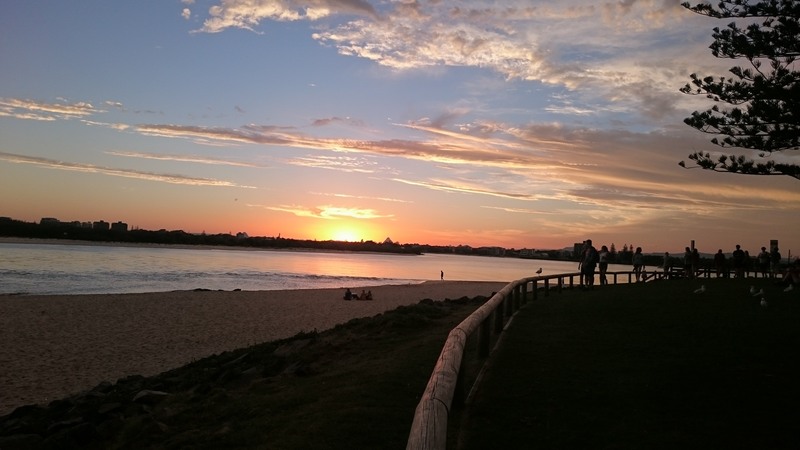 01/2016 – Introducing our Term 1 Program for 2016! 12/2015 – The location for Deeper 2016 can now be revealed!… (cue trumpets…) YES We are finally heading back to the Bunya Mountains! We have fully booked both sides of Toolburra, a large wooden chalet in the heart of the Bunya Mountains. Get excited teens! 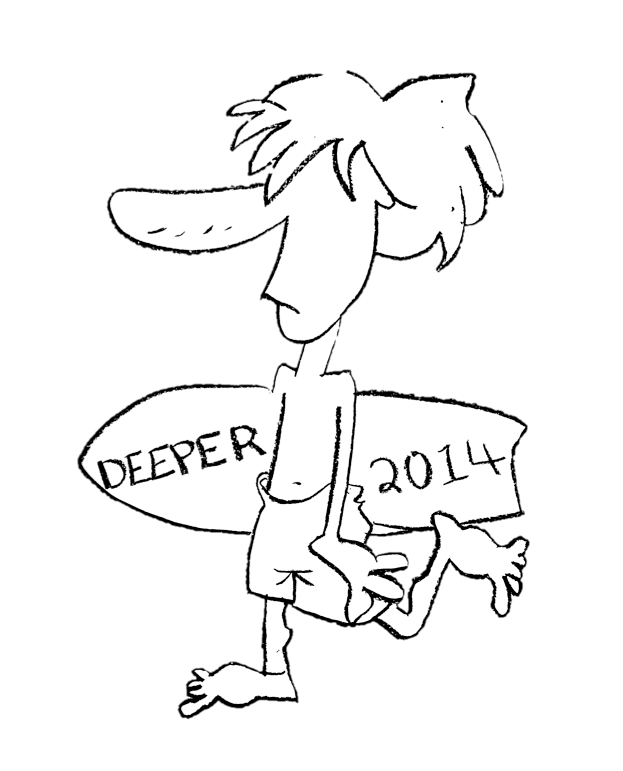 Deeper starts July 8-10. 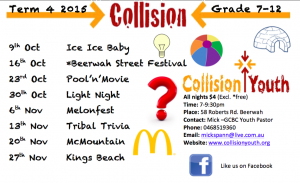 10/2015 – Did you see us at the Beerwah Street Festival?! 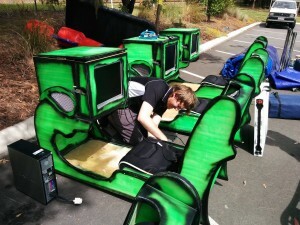 (The stall with all the couches, gaming machines and Gladiator Pit Jumping Castle??). It was a huge night as we celebrated our community. If you didn’t get a chance to hang out in our TeenZone this year we’re planning to do it all again next year! 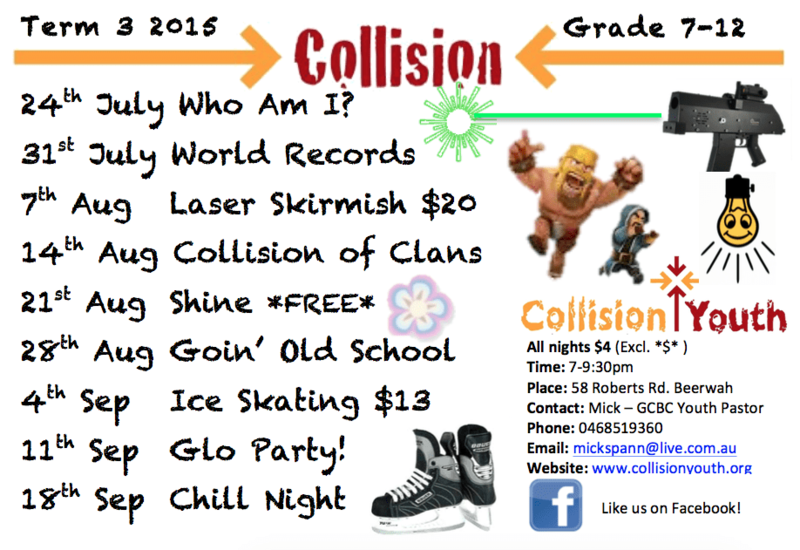 10/2015 – Introducing our new Term 4 Program! Woohoo! 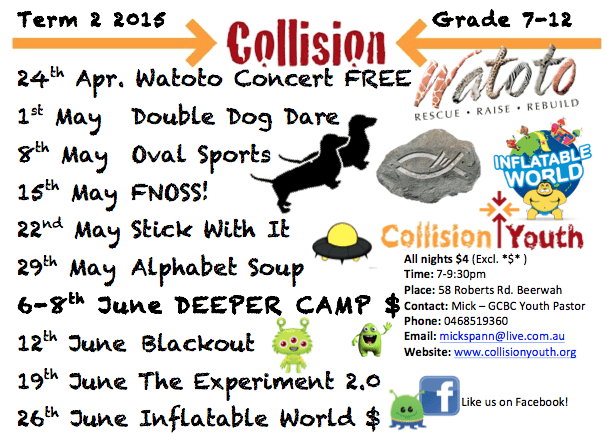 07/2015 – Introducing our new Term 3 Program! 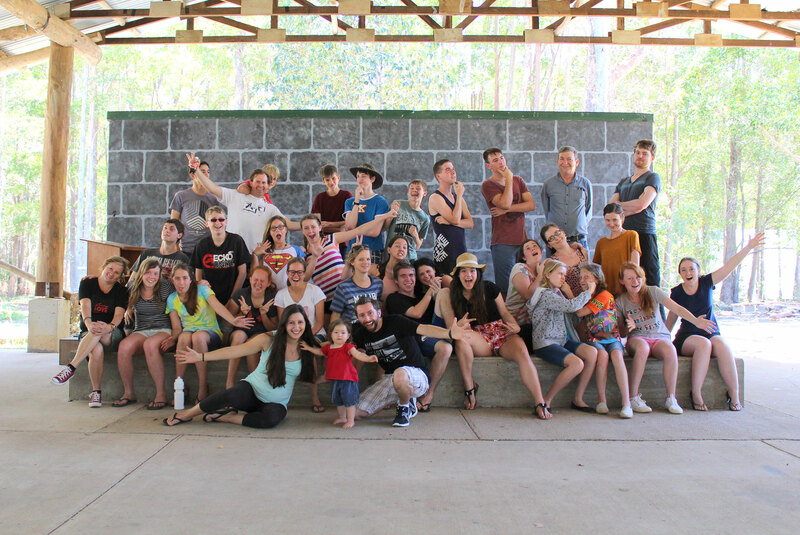 06/2015 – The group had a fantastic time at our Deeper Discipleship Camp! This year we held the camp at the Church (which was pretty crazy!). The teens learned a lot about the Bible and how it stands apart from other religious holy books as being the inspired, inerrant, revealed Word of God Himself. It was a huge weekend, but we are so thankful for what God has been teaching us. To read our study sessions follow this link: Deeper Discipleship Camp. 01-2015 – Happy New Year!!! This year Collision youth says goodbye to leader Julian, who has been with us since high school. We also introduce 6 brand new leaders to our 2015 leadership team. 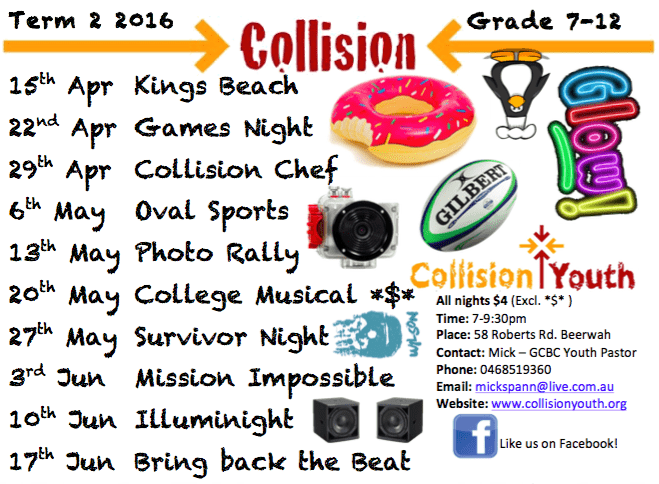 This year promises to be a very exciting year at Collision Youth! 10/2014 – The 2014 Deeper Discipleship Camp was a huge success! Praise God for his work and a big thank you to everyone who made the camp possible. We had a great bunch of young people along (double the number from last year) who made the camp a joy to lead. SO KEEN for next year! 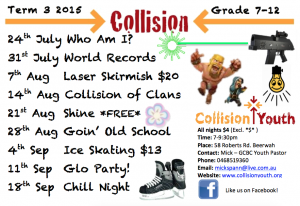 09/2014 – Introducing our first instalment of the Term 4 program! 07/2014 – After a good break our Youth Team were able to get together an attend the OneDay Conference (by QB Youth). This was a fantastic training event where we were encouraged, challenged and inspired in youth ministry. The team came back with quite a buzz and we can’t wait to kick off Term 3! 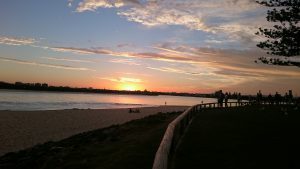 07/2014 – One of our “Collision Crew” Matthew Gibson has just returned back to Australia after he and a team of others rode around Cambodia on pushbikes to raise support for the less fortunate. Matthew and the team combined to raise $50,000 to enable Baptist World Aid to continue helping those in Cambodia who need it most. Good on ya Matt! Champion! 06/2014 – We are still awaiting some outstanding Blackout Booklets and money to come in, however at last count we raised just over $1500 for Open Doors Youth. This money is destined to go where it’s needed most, supporting Christians overseas who are facing heavy persecution because of their faith in Christ. Thanks everyone for your support! 04/2014 – This information letter is going home to parents at the start of Term 2. 02/2014 – The planning for Deeper Discipleship Camp 2014 is underway. This year our theme is ‘Water’. 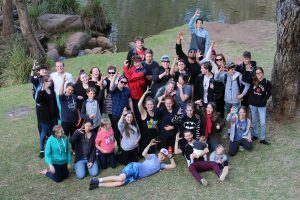 The dates are the 4th-6th of October and we will be at the TeenMissions Campsite in Tewantin (Noosa). We will be basing the camp on a similar structure to last years camp. However we are expecting to host a slightly larger group. (30-40 people). Get excited teens! More details coming to the ‘Deeper Page’ shortly. 01/2014 – Introducing our new program for Term 1 2014! It’s going to be a great year. 10/2013 – The Deeper Discipleship Camp was a huge success! All the campers had a really great time digging into God’s Word and having a lot of fun together. From all of the Camp Leaders THANKYOU for being such a great bunch of young people! Praise God. Based on the success of the camp we are now planning Deeper 2 for next year. 08/2013 – We are proud to announce that our first ever Deeper Discipleship Camp will be held from the 27th-29th of September this year! This is very exciting for us as a team because for the first time we will be able to spend a few consecutive days with our Christian teens talking about Faith, The Bible, and what it means to be a follower of Christ. WOOT! Check out the “Youth Camp” link for more info. 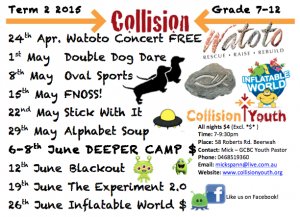 07/2013 – Collision Youth raised $105.20 for Open Doors during the BlackOut event. Congratulations everyone who was a part of this! You’re all awesome. Many persecuted Christians around the world will be helped because of your support. 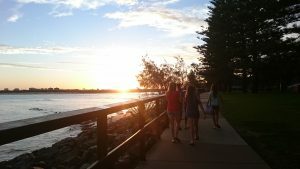 07/2013 – The Collision Team have just come back from the Queensland Baptist “One Day Conference.” It was an awesome time of training and encouragement with hundreds of other youth pastors and leaders from around Queensland. 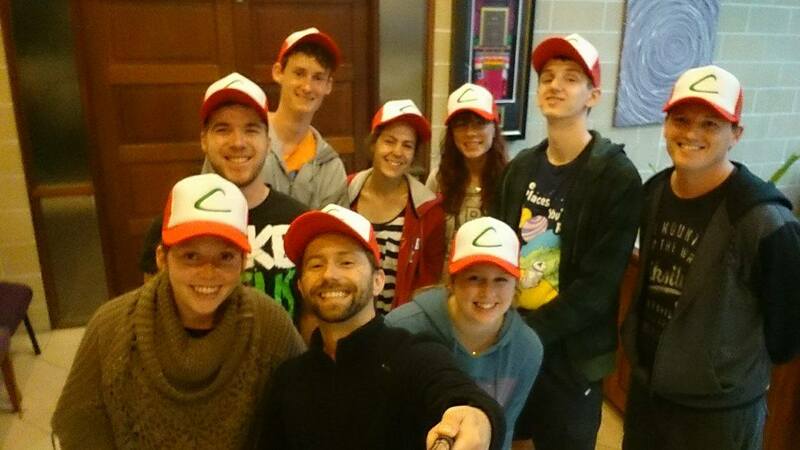 Get excited people… your youth team is! 07/2013 – A number of our teens recently attended the Operation Mobilisation camp “TeenStreet”. They had an absolute blast spending time worshiping God, learning from his word and hearing some great speakers. Stoked to see how God uses these young people for His glory in the near future. 05/2013 – The Collision Team have been all buzzing with “cluckiness” over the birth of Mick and Anne’s new baby girl Alayna. She’s a bit young to hang out on Friday nights but she’ll be making appearances from time to time. Mick and Anne would like to thank everyone for their warm wishes and prayers! Very exciting times! 02/2013 – Sunday the 24th of February we held our very first Youth Service EVER! It was an awesome time of Praise to our God and good biblical teaching. This service is a brilliant example of the way our youth ministry has flourished by God’s grace. If you missed out don’t stress, you can still listen to Dan’s sermon online! Just click the Youth Service link. Our next service is on the 10th of March. See you then! 02/2013 – The year has started off with a bang. Introducing our brand new First Term Program! We are really looking forward to this year and can’t wait to see what God has planned for our Youth Ministry in 2013. 10/2012 – We have now finished our “One With Them” campaign. Many of our teens wrote encouraging messages to persecuted Christians last friday. You can read these and other messages by following this link: One With Them Collision Youth was also able to put money towards the purchase of 7 bibles which will be sent overseas to persecuted Christians who otherwise wouldn’t have access to one. 10/2012 – Tonight (12th October) term 4 kicks off! 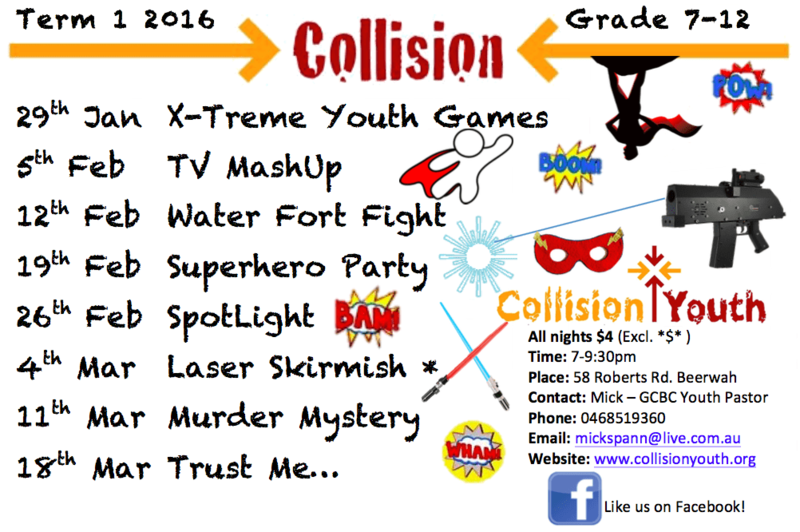 We are all very excited about our new Term 4 program and cant wait to get together again after the holidays. Make sure you check out our new program and download our information package for the upcoming summer camp! 09/2012 – 3 of our 4 new XBOX units are now up and running. We got the chance to test them out last week at the All Nighter. Those XBOX’s didn’t get a break the whole time! A big thankyou to Strathpine Baptist for these units. The 4th should be up and running early next term. 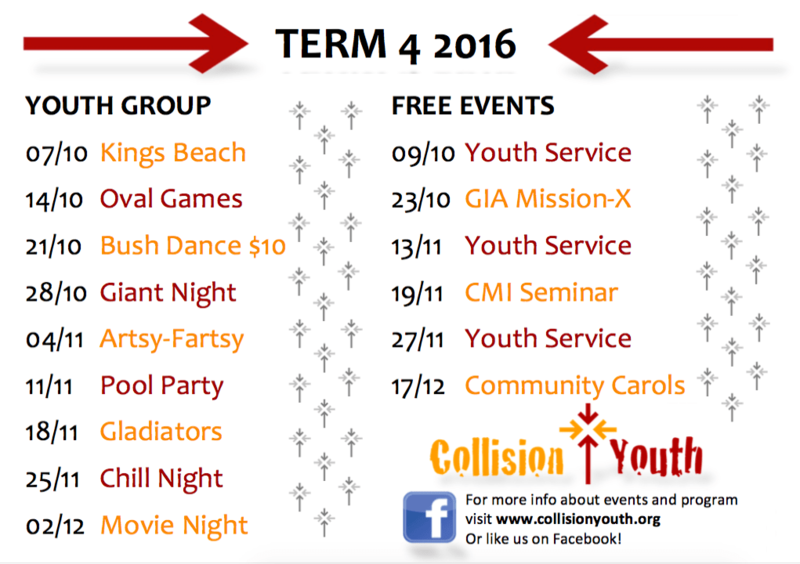 09/2012 – Term 4 will be a huge term including Roller Blading, Messy Games, a trip to Kings Beach and our end of year YOUTH CAMP (more details to come)! 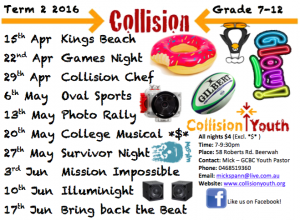 This term we will also be inviting grade 7 students to join in on the action. 09/2012 – The Youth Alive concert was an awesome time. The group really enjoyed themselves and loved rocking out to Evermore and the other bands. Many teens also heard the good news about Jesus Christ and responded by committing their lives to the Lord. Praying that these commitments would be life changing and not just something they will forget. All in all it was a great night had by everyone. 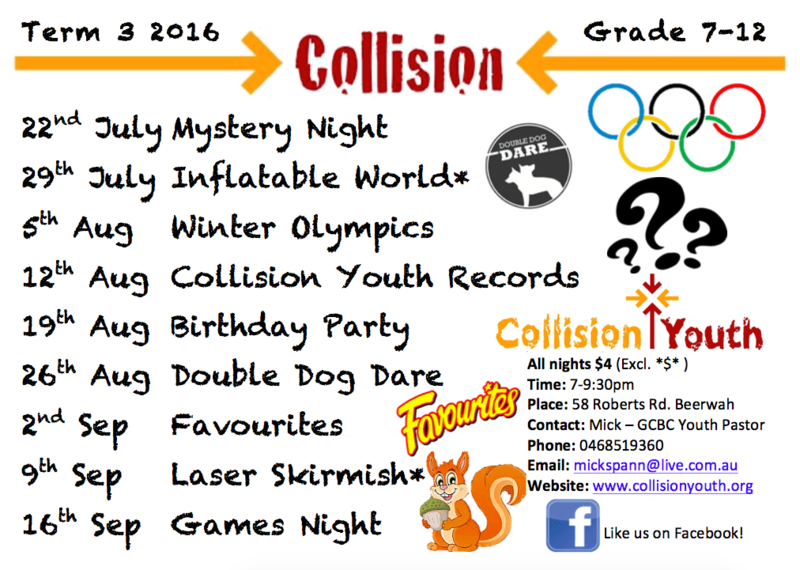 08/2012 – Those teens keen to come to Youth Alive please follow this link Youth Alive Permission Slip to download the Permission Slip. Please hand in this slip (and $15) by this Friday night (31st August) to get the early bird price. If you are late ticket prices will rise to $20. These are also available from Mick or the GCCC office. 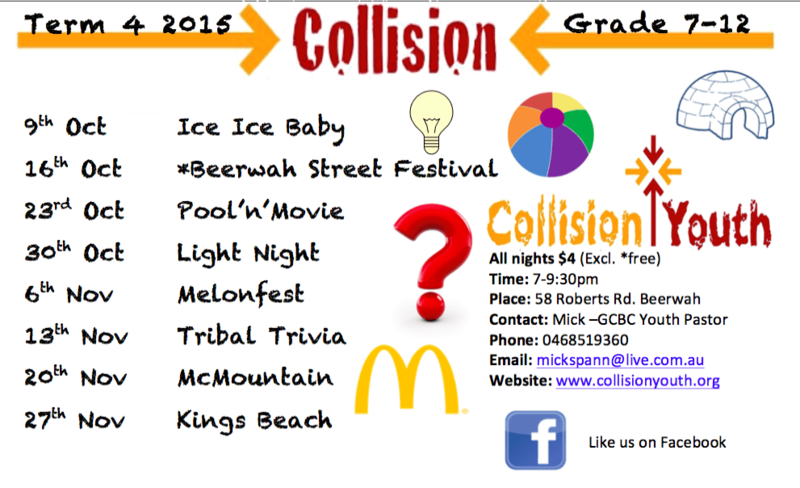 08/2012 – Tonight (17th August) Collision Youth is hosting the “start party” for our “40 Hour Faminers” from GCCC. The Famine begins at 8:00 tonight so wish them luck! 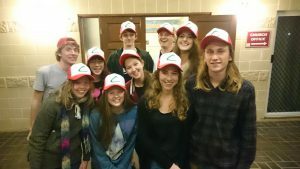 Remember to support these guys as they undertake the famine to raise money and awareness for the work of World Vision. 08/2012 – Collision Youth has just inherited 4 XBOX gaming units from Strathpine Baptist Church. We plan to have them up and running in the youth room within a few weeks. STOKED! 07/2012 – Term 2 Finished off with an awesome time at our Survivor Youth Camp. We had an great time. So much so that another camp is being planned for November! Stay tuned for more details! 06/2012 – Introducing ‘Chuck’ the ‘Chicken Duck.’ Our new Collision Youth Mascot. Won for us by the teens at our last LaserZone Event in Term 2.